I began printing Handset Journal in 1970, shortly after joining the American Amateur Press Association. 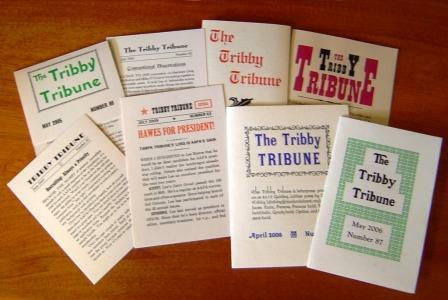 The next year I launched Tribby Tribune for smaller issues, saving HJ for larger projects. Beginning with number 7 in February 1972, Handset Journal has been printed with 4½ x 6 inch pages. Type is 10 or 12 point, set on an 18-pica line width. I can set and justify about 14 lines per hour, so it takes about 90 minutes to set a page (and another 45 minutes to distribute type back into the case when the press run is complete). Several issues have gone to 16 pages. The Tribby Tribune uses a greater variety of formats. Page size has varied from 2 x 3½ inches to 9 by 12 inches. Most issues are two or four pages. Between 1979 and 2003, several issues were computer-generated. The Tribune reached the number 100 milestone in June 2009. 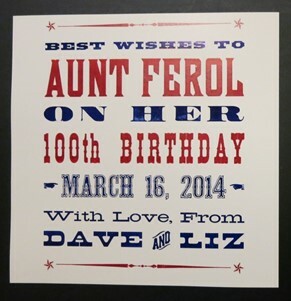 Printing wedding invitations is exacting work, but also rewarding. It's fun to work with couples to plan invitations that reflect their own personalities. I'm often amazed at the creativity and spot-on sense of design they bring to the effort. 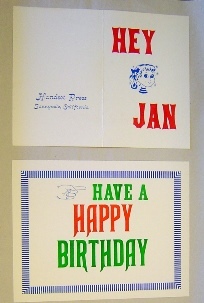 The couples, their families, and members of the wedding party are involved with the typesetting and printing. Check out the Picasa photo album Handset Press Invitations and Announcements to see examples. My sisters enjoy the hobby of creating greeting cards using rubber stamps, pens, layers of paper, and other "crafty" elements. I don't compete with their elegance, but using the Vandercook press and vintage wood type, I have my own distinctive look, usually on a large-format card. Because of the short run (usually a single card), these are hand-inked. I also print our Christmas cards. These are usually printed on the Golding Jobber due to the longer press run. 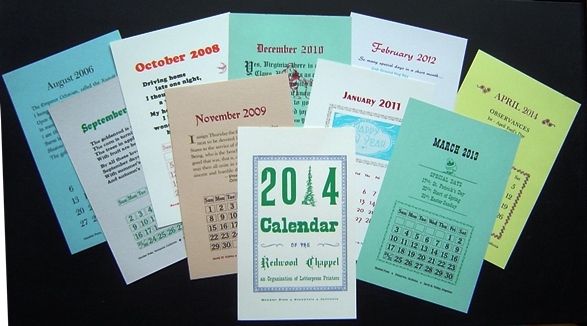 Each year, members of the Redwood Chappel print pages for a calendar. The pages are collated and distributed at the annual meeting, usually held around the end of October in the Eureka area. It's always a fun project -- and something friends & family can use throughout the year.